I have a folder full of markdown files that get used by a different tool. I'd like to keep a Marked-compatible Multi-File document outside of that folder so the other tool doesn't see it. I can't seem to get this to work. I've tried mmd-merge with the directory path but images don't get rendered. Am I missing something? Is this capability not supported by Marked? I forgot, I tried mmd_merge because I wanted the indented header levels. Is that possible without the #merge syntax multi-file document? directly, it would need to be !(../images/image1.jpg). of the index file. Does that make sense? you're using with the same files. I've attached a screenshot of what a sample project folder would look like. Would it make a difference to your other tool if the index had an extension other than md? I usually name mine index.marked (any extension will work). Oooh, good call. The other tool only supports a few extensions so I could try this! I don't know why I didn't think to mention this, but you could try setting an "include base" metadata key to specify the base directory your other files are in. 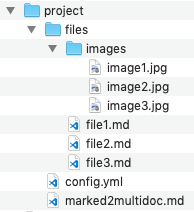 That should alter the base directory that Marked is looking for included files from, so when an image is referenced with "images/image1.jpg", it should look for it in "files/images/image1.jpg". I can't guarantee this works, it's a bit fickle and I haven't tested in this case, but worth a shot if you're still figuring this out.